This historical building dated between the 14th and 15th century A.D., is situated between the central gate of the Castle of Chios and the main square of the town. It was, perhaps, the headquarters of the Genoese Podesta. Disfigured by Turkish alterations and additions, it was restored during the years 1980- 1986 by the Archeological Service. 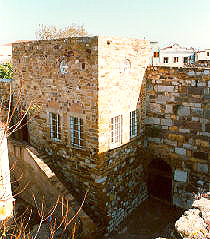 The building maintains a fortress - like appearance and has two floors, each containing one room. On the northern side of the Palace, there is an external stairway which leads to the walls and the southeast tower of the Castle. In the actual exhibition, Byzantine murals, post - Byzantine icons, Byzantine and Genoese sculptures and small-scale works of art are on display.